Afghan news channel, Tolo TV, wins AFP prize. Paris, November 2016: Independent Afghan TV news station Tolo has won the 2016 Agence France-Presse Kate Webb Prize for its consistently fearless work reporting in one of the world's most dangerous countries. The prize, with a 3,000 euro purse, honours journalists working in perilous or difficult conditions in Asia, and is named after a crusading AFP reporter who died in 2007 at the age of 64, after a career covering the world's troublespots -- including Afghanistan. 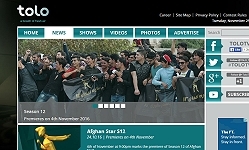 TOLO News is a privately-run station that is often critical of the insurgent groups that wreak carnage across Afghanistan. Its journalists are among a small band of media workers who put their lives on the line to explain what is happening in their war-wracked country. “We are recognising Tolo News for its courageous work telling the stories of the people of Afghanistan, a place that is becoming ever more hostile for the media," said Philippe Massonnet, AFP’s regional director for the Asia-Pacific region, and jury chairman. “By awarding the prize to TOLO as an organisation, we are also recognising the extraordinary work carried out by all Afghan journalists in ever-deteriorating conditions,” he added. TOLO News has already paid the ultimate price for its dedication: seven of its employees were killed in a targeted Taliban suicide bombing in January 2016, an attack denounced by rights groups as a "war crime". Lotfullah Najafizada, the director of TOLO News, said the loss of so many valued friends and colleagues had made 2016 a difficult year. “This is a great honor for TOLO News,” he said. “The late Kate Webb was an inspiration to dozens of our journalists, who like Kate, have earned a reputation for being fearless in the face of adversity." Organisations like TOLO are vital if the world is to understand the horrific effect that years of conflict have had on the people of Afghanistan, said Massonnet. "At AFP we are only too keenly aware of the dangers faced by reporters working in the country, having lost one of our own colleagues there in a bombing two years ago," he added.